Arkansas Tax Free Weekend 2018 now official! 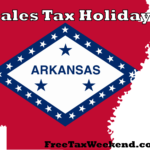 Arkansas Sales Tax Holiday 2018 starts on Saturday August 4th, and runs until Sunday August 5th, 2018. Arkansas will hold its sales tax holiday allowing shoppers the opportunity to purchase certain School Supplies, School Art Supplies, School Instructional Materials, and clothing free of state and local sales or use tax. Sales tax will be not be charged on clothing and footwear if the sale price is less than $100 per item, clothing accessories and equipment if the sales price is less than $50 per item and all school supplies, art supplies and instructional material. Accessories include cosmetics, hair accessories, handbags, jewelry, sun glasses, wallets, watches, etc. Art supplies are limited to clay and glazes, paints, paintbrushes, sketch and drawing pads and watercolors. Instructional material includes textbooks, workbooks and references. Clothing includes all clothing: footwear, diapers, receiving blankets, wedding apparel, gloves, aprons, hats, neckties, coats and jackets, wedding apparel and formal wear if the marked price is under $100. It’s listed as, “all human wearing apparel,” which means it will benefit more than just the back to school crowd. Computers, software and peripherals are not tax exempt. A store can reduce the price of an item (ie: a sale that offers 20% off a $100 pair of jeans bringing it below the $100 per item maximum) and you’ll still get the tax exemption. However, a manufacturers coupon (ie: a coupon for $20 off a pair of $110 jeans) does not lower the actual sale price and therefore the item would still be subject to sales tax. No, there is not a limit on total items you can buy. The only limit is the price per item limit listed above. You can buy as many $99 shirts as you would like and still be exempt. Likewise, you can purchase all your school supplies and back to school clothes together. No matter what the total cost, your items will still be exempt if they meet the criteria listed above. If one item does not meet the criteria (a $101 purse, for example), your other items will still be exempt. You will only be charged sales tax on that particular item. For non-exempt items, is sales tax charged on the whole amount or just the amount over? If you purchase a non-exempt item, sales tax is charged on the entire amount. For example, all clothing over $100 is non-exempt. If you buy a $300 suit, you will be charged sales tax on the entire $300, not just the amount over $100.